To make your leaf art have depth you need to add shadow and highlights. 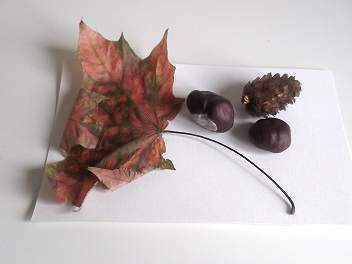 As we did in the first part of this tutorial for our collage, select a leaf but this time use some other natural objects to make an interesting composition. We also allowed them to dry up which created lots of shadow. Use an artists easel or a piece of hardboard to work on in an upright position. If you lay your board flat your hands will smudge the drawing. 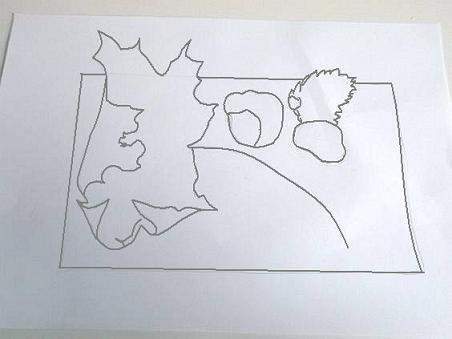 Draw a lightly sketched outline of the still life. I have made the lines bold for the illustration so you can see them. Don`t try and make the outline a mirror image of what you see. You are not trying to take a photo. Drawings are about colour, texture and interesting compositions. With pastels you should work with dark colours first then add the light but there is no hard fast rules with art. 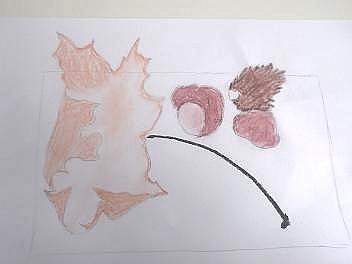 In this drawing the light parts were sketched in and the darker greens, reds and browns were built up. You can use different techniques to achieve a variety of effects. Use your finger to smudge, or a dry paint brush to take away some colour. Blend colours together to form gradients. Work with very dark colours rather than black to create deep shadow. Try and see what hues are in the shaded areas and in the lighter parts. The paper that my still life was lying on had a touch of yellow and blue in the shadow surrounding it. Following the edges of the leaf there was a very light halo like effect. Drawing this in, helped separate the background from the subject making my leaf art leap from the page. Notice the veins how they are larger than reality and raised as they disappear around the bend creating the withered effect. Drawing dark tips emphasized their sharpness. Shiny surfaces have highlights, so the two conkers show 3 or 4 highlighted areas. Contrasted with shadow the conkers took on their unusual dried shapes. I could also see blue and red hues in the brown. 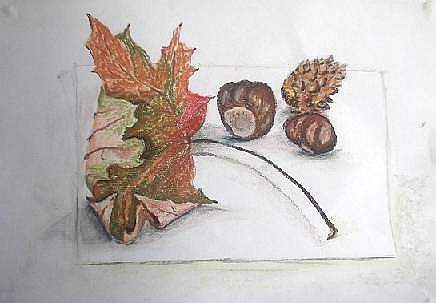 Pine cones are interesting subjects to draw. They are full of contrasting light and shadow. Drawing them is a good exercise in creating texture. Notice that yellow has crept into the composition. You can see this colour in the stem raising it to stand out against the scales. Lastly the long shadows were added. See the stem shadow how far away it sits from the stem raising it up from the paper. 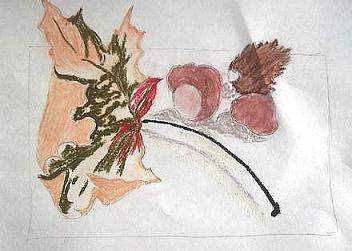 I could have continued further with this pastel leaf art perhaps introducing more reds and plum colours that dominate, but lets end there. Now see what you can draw. 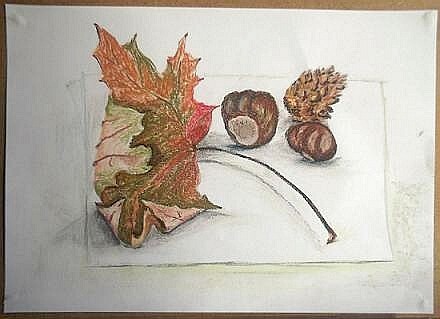 I hope this leaf art exercise will have taught you the basics of drawing with shadow and highlights. We have more Autumn crafts!